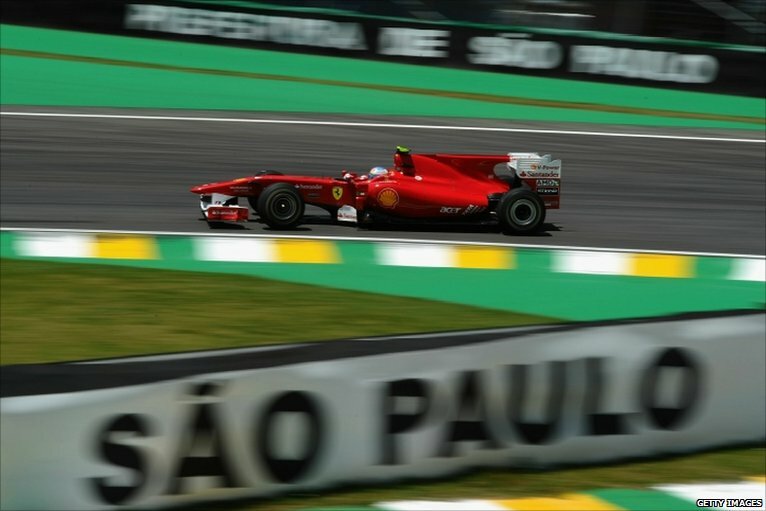 F1 is in Brazil for its penultimate round of 2010 championship of Brazilian GP on Sao Paolo’s Interlagos Circuit. Interlagos has produced excellent racing in the past and will certainly provide another interesting race this Sunday, as the championship is still up for grab and there are 4 title contenders still in the hunt. May be at the end of this GP, the title contenders could come down to 3 or may be it could move up to 5 or it might remain the same 4, no one have a single clue about it. Although some people thinks that in this race, the title could be taken by Alonso who is leading the championship with 11 pts ahead of Webber but the way this championship has developed this looks unlikely and the chances are the title could go down to the wire just like 2008. The weather prediction is wet, qualifying is expected but the race day will remain dry. In Practice Session 1, RedBull dominated the session with Vettel taking top spot and Webber behind him. Hamilton of McLaren and Button takes 3rd and 4th respectively. Ferrari’s were off the pace as Massa struggles with under steer while Alonso was using a high mileage engine which was gone at the end of the session. Kubica and Rosberg take 5th and 6th respectively with Barrichello and Schumacher finishing 7th and 8th. Sutil was 9th ahead of Saubers Heidfeld 10th and Kobayashi 11th, Hulkenberg 12th, Alonso 13th, Massa 14th, Petrov 15th, Liuzzi 16th, Alguersuari 17th, Buemi 18th. The new teams were at the back with Trulli 19th ahead of Glock 20th, Heikki 21st, Di Grassi 22nd and both HRT’s at the last 2 spots with Klien who replaces Yamamoto on 23rd and Senna on 24th. There were 2 notable incidents during the session; first Petrov crashing in the wall and then on the last lap Kobayashi spins and crashed in the wall. The time sheet for the session is given below. Second Practice Session, also sees RedBull taking the top spots but Ferrari showed more pace then they had showed in the first session, with Alonso taking 3rd ahead of Hamilton on 4th, Massa was 5th ahead of Kubica on 6th and Button was down on 7th. Heidfeld was 8th with Rosberg on 9th and Michal on 10th. Barrichello was 11th, Kobayashi on 12th, Hulkenberg 13th, Sutil 14th, Petrov 15th, Liuzzi 16th, Buemi 17th and Alguersuari 18th. Trulli 19th was again leading the new teams with Heikki 20th, Di Grassi 21st, Senna 22nd, Klien 23rd and Glock was last on 24th. Images by Getty and Reuters via BBC.